Gatorade Powder 03944 Variety Packs is the best choice for Hot sunny days in Texas. 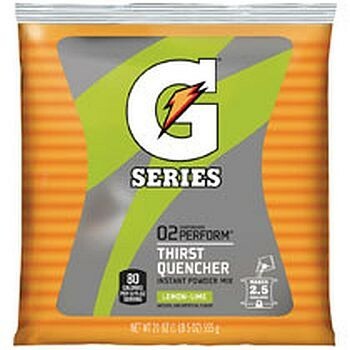 Gatorade 03944 is the solution whether it's Dallas, Ft Worth, Austin Houston or West Texas. Gatorade 03944 powder packs are the way to go to keep people fresh and hydrated. Gatorade is made for the Industrial Workplace Athlete. Buy Gatorade Variety Pack 03944 with electrolytes and carbohydrates to keep those needed to help employees stay hydrated, work safely and productively in the work environment. Powdered Gatorade helps maintain workplace performance with electrolytes being rapidly absorbed into the blood stream to help prevent dehydration as well as muscle fatigue during prolonged physical exertion. Powdered Gatorade Variety Pack 03944 is the energy drink made for the Industrial Workplace. Powdered Gatorade Variety Pack 03944 with electrolytes and carbohydrates needed to help employees stay hydrated, work safely and productively in the work environment. Powdered Gatorade 03944 helps maintain workplace performance with electrolytes being rapidly absorbed into the blood stream to help prevent dehydration as well as muscle fatigue during prolonged physical exertion.